Pro Wrestling Revolution returedto Santa Rosa on March 26th at the Santa Rosa Veterans Memorial Auditorium. 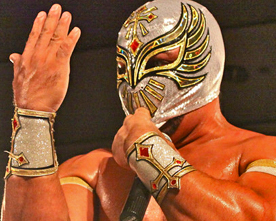 This show was SOLD OUT, “No Mas Boletos” was heard at the ticket window, as it had the return of Rey Misterio Sr.’s son, Hijo de Rey Misterio, who made his 1st appearance in many years, and of course the debut of the man of many faces, the orginal Sin Cara , El Príncipe de Plata y Oro – El Orginal Mistico. 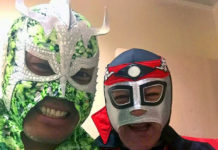 BorderPatrol® over Los Campesinos II y El Mariachi vs.
“Papo Esco” Raul Escobar over La Pantera Jr.